Welcome to the Richards Game Studio Games page, the showcase of released games. At the moment R.G.S. 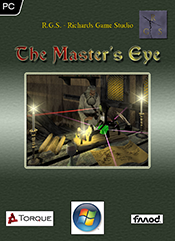 released The Master's Eye and the playable demo of The Master's Eye, which you can download for free and contains the first 2 missions of the game. Visit the Projects page to see what other games and projects Richards Game Studio is working on. The Master's Eye is a first person, role-playing game in a fantasy and medieval setting and takes place in the lands of Ishkandragh. Your character (male or female) starts as a young peasant from a small hamlet high in the Smokey Mountains in the northwestern part and sets off on a journey to Ishkan, the capital city of Ishkandragh, to find his uncle. During this trip, he or she will meet nice people, ugly people and many more creatures. The reason for this journey is not immediately clear, but it seems to have something to do with a Magickal device called the Master's Eye, which was created aeons ago by the wizard Ishkan. Ishkan, later known as The Master and founder of Ishkandragh, had used this device when he sent a Daemon Lord back to the hell it came from, and defeated its summoner, Kragh the Necromancer. After your payment is completed, The Master's Eye is added to your product list and can be downloaded from the My Products section of your MyRGS account. The playable demo of The Master's Eye contains the first 2 missions of the game. All the current game functionality (including all save and load options and the manual) is present in the demo, so you should get a good idea of how the game will look and feel. Also, if you are in doubt that your system meets the minimum requirements, just download the playable demo of The Master's Eye, and try. You can be sure that when the demo runs without problems, the payed version will as well. Below you find screenshots from The Master's Eye. Click on an image to enlarge/shrink it. The button below the images will shrink all enlarged images with one click. Character selection screen. You can be male or female. Character development, learning new skills and abilities throughout the game. Missions with side-plots. Completion of a mission will give you information to get to the final. Completion of side-plots will give extra abilities, skills or special weapons and magic. Many different kinds of weapons and enemies. Magick. Learn spells to kill your enemies faster. Interaction with the characters based on behavior and reputation. For example, haggling with shopkeepers is less successful when having a bad reputation. Extensive action set including: Talk, Get, Use, Bribe, Picklock and more. 2 Levels of difficulty, the harder one requires the player to eat, drink and rest on regular intervals, amount of air when submerged is limited. Save/Load any time you like, in-game QuickSave/QuickLoad and AutoSave of your progress after completion of a quest/mission. Playable with keyboard, keyboard/mouse or gamepad. Comprehensive manual in 3 formats: browser, printable and in-game, and for those who do not like to read manuals there is an in-game help function available. This is a gameplay video of the first mission of The Master's Eye. There are a few places on the web where you can find information about The Master's Eye. One of these places is our Community, which has a section dedicated to The Master's Eye. Other places are: The Master's Eye website, The Master's Eye on Twitter and The Master's Eye on Facebook.